At the level of regional strategy, Egypt has a central role in the anti-Iran coalition of Sunni Arab states, which includes Saudi Arabia, Kuwait, Bahrain and the UAE. The violence of the Arab Spring brought to the fore the inevitable confrontation between a revisionist, aggressive Shi'ite Iran and the Arab countries deploying to defend themselves against Iranian aggression, mainly in Yemen, Syria, Iraq and Africa. There might, however, be a confrontation -- unfortunately with the United States. Even as the Iranians proceed with developing nuclear weapons and using proxies to destabilize the Arab and Muslim states, the American shoulder grows colder towards both Israel and the el-Sisi government in Egypt. The current U.S. administration is known throughout the Middle East for empowering its enemies and being treacherous to its friends. The traditional Arab stance, used by autocratic leaders to bamboozle their dissatisfied populace by pointing them at an external villain instead of at our own leaders, has clearly begun to change. Israel as the greatest enemy, is, correctly, being replaced by Iran. The presence of the Egyptian foreign minister in Israel last month came as a surprise to many. Critical Egyptian public opinion and the Egyptian media indicate that, in the years since the Israeli-Egyptian peace was signed, the formal agreement has yet to trickle into public consciousness and that there is still considerable suspicion on both sides of the border. The same is true of the peace between Israel and Jordan. Under the reign of the Muslim Brotherhood's Mohamed Morsi, relations had reached a new low, with Egypt covertly aiding Iran's proxy, Hamas, against Israel. 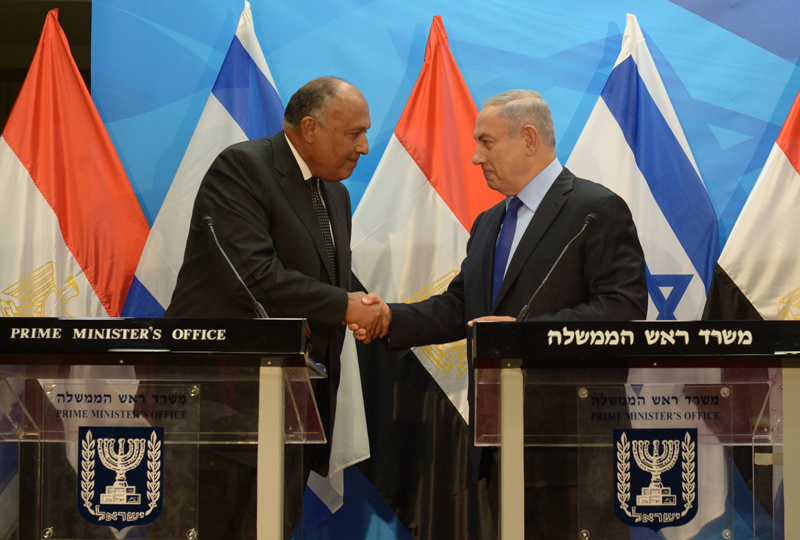 The visit of Egyptian Foreign Minister Sameh Shoukry to Israel in early July 2016 could be an indication that the frozen peace between Israel and Egyptians, signed by Begin and Sadat in 1979, might be thawing. Under such circumstances, even publicizing any kind of cooperation between Egypt and Israel indicates a thaw and could, for the benefit of the Arab and Muslim world, be the beginning of legitimizing bilateral relations. Shoukry's visit to Israel might even have been intended to pave the way for a broadening of relations with Israel and an avowal of the hitherto covert cooperation between many Arab and Muslim states and Israel. However, given the current situation of Egypt's rapprochement with Israel and Russia, there might be a confrontation -- unfortunately with the United States. Even as the Iranians proceed with developing nuclear weapons and the ballistic missiles to carry them, and as they use incitement, weapons, money, and proxies to destabilize the Arab and Muslim states, the American shoulder grows colder towards both Israel and the el-Sisi government in Egypt. The current administration is known throughout the Middle East for empowering its enemies and being treacherous to its friends. We joke that is far better for a country to be America's enemy than its ally: it will then spend unlimited amounts of wealth and effort and wealth to woo you. It seems never to have met an enemy it did not like. Both Israel and Egypt regard Hamas as a terrorist organization because it collaborates with ISIS in the Sinai Peninsula and because it is the Palestinian branch of the Muslim Brotherhood, whose sole avowed purpose is globally to spread Islam. According to sources in Egypt, Israel deliberately leaked information about firepower and intelligence aid from the Israel Defense Forces (IDF) to the Egyptian forces operating in the Sinai Peninsula to use this "collaboration with the 'enemy'" to strengthen relations between the two countries. It is, however, in the interest of Arab and Muslim states to find a solution as soon as possible to get the Palestinian problem off the agenda, to be able to form a united front against Iran. It might even help to win if such a "strong horse" were included. The visit of Egypt's foreign minister to Jerusalem seemed a signal to the Palestinian Authority to lower its expectations. The traditional Arab stance, used by autocratic leaders to bamboozle their dissatisfied populace by pointing them at an external villain instead of at our own leaders, has clearly begun to change. 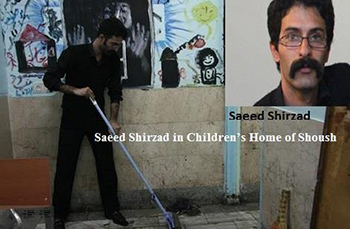 Israel as the greatest enemy, is, intelligently for most of us in the Arab and Muslim world, being replaced by Iran. The visit to Israel also indicates that Hamas has weakened the Palestinian Authority's legitimacy and ability to maneuver, as it continues to present itself as an obstacle to a solution to the Israeli-Palestinian conflict and keeps Western countries busy with its marginal problems, preventing them from dealing with the genuinely critical regional issues. Like it or not -- and they could do worse -- at some point the Sunni Arab states would be wise to allow Israel into their trenches as they fight to the death against Iran. The last times Egyptian dignitaries visited in Israel was in 1995, when President Mubarak attended the funeral of Israeli Prime Minister Rabin, and later, when the Egyptian Foreign Minister Ahmad Maher visited Jerusalem and was attacked by Palestinians while he prayed in Al-Aqsa mosque.